You can Ritual Summon this card with “Machine Angel Ritual”. If this card destroys a monster by battle and sends it to the GY: Inflict damage to your opponent equal to that monster’s original DEF in the GY. If this card is Tributed: You can add 1 LIGHT Fairy monster from your Deck to your hand. Cyber Angel Benten is our Throwback Thursday choice for the Cyber Angel week, and while it is weak for a Level 6 Ritual Monster, it has some good payback in its effects. Benten may be most useful used as tribute fodder for another Cyber Angel Ritual Monster. Getting that LIGHT Fairy search is like having another Manju for the deck. Not only that, but you can always bounce Benten back from the grave to your hand with another card and Ritual Summon it if you choose. It is worth noting that neither of its effects are once per turn, so you could tribute this thing off as many times as you like to get your searches. The burn damage off destroying a monster is okay at best. Low ATK monsters do have decent DEF, but Link monsters have no defense, so no damage there. Many big boss monsters are balanced out by having low DEF, leaving you out of luck if you spin them to defense and destroy them that way. Without a boost from something like Honest, the max you can do is 1700 damage, which is close to a quarter of your opponents opening LP. Nothing to scoff at, but Benten’s best use is with that unlimited search ability. Cyber Angel Benten is a Level 6 Light Fairy-type Ritual Monster with 1800 Atk and 1500 Def. The stats are bad for a Level 6 and worse because she’s a Ritual. However, this throwback Thursday gal has great effects. When tributed, you get to search any Light Fairy-type monster from your deck to your hand. Or if Benten manages to destroy something by battle and sends it to the grave, your opponent takes the monster’s Def as damage. Neither effect is once per turn, but the burn damage has problems since some monsters don’t go to the grave (tokens, pendulums, future stuff probably) and some monsters don’t have Def (0 Def, Links, future stuff probably). Couple those problems with only 1800 Atk makes the effect a true throwback to the days before those problems. The search effect not being once per turn is the real reason to run 3 of these. It would be funny for me to have this be Kaiju’d and then you get a search. Also, many things in the deck will pump Cyber Angel Benten to a respectable Atk. Looks good too. I did mention yesterday that there is something you could tribute with Merciful Machine Angel to get a search to negate that minus, and you can tribute it with Incarnated Machine Angel from Tuesday as well, and here is that card you’d like to tribute, Cyber Angel Benten. Cyber Angel Benten is a Level 6 LIGHT Fairy Ritual with 1800 ATK and 1500 DEF. Stats are very low on a Level 6, but if you tributed Idaten to Ritual Summon Benten then this becomes 2800/2500 which is very strong on a Level 6, LIGHT and Fairy are also two great assets. 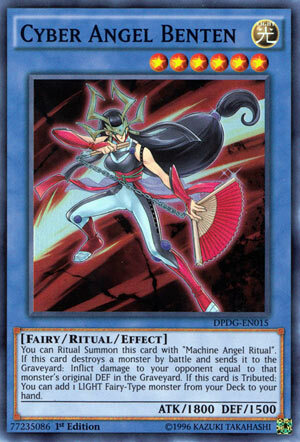 The Ritual Card that is meant to summon this is Machine Angel Ritual, but you also got Machine Angel Absolute Ritual in the deck if you want to use that instead or use Incaranted Machine Angel to summon this, though you’d prefer to tribute Benten instead of summoning it. If this card destroys a monster in battle and sends it to the GY, inflict damage to your opponent equal to the monster’s original DEF in the GY. This won’t do anything destroying a Link Monster, and being 1800 ATK means this won’t kill anything that strong unless you tributed Idaten while this was on the field. Still, burn is burn and I can’t complain about this, especially considering this was the anime effect from when it appeared in GX back in the early to mid 2000s. Considering this was printed in 2016, though, they gave it another effect because otherwise it wouldn’t be played in this day in age. If this card is tributed from anywhere, you can add 1 LIGHT Fairy from your deck to your hand. Love how this isn’t a hard once per turn, meaning you can get multiple searches from tributing multiple Benten. There are a ton of great options as well, including the Cyber Angel Rituals, Cyber Petit Angel, Cyber Egg Angel, Manju and Senju, Herald of Perfection, Honest, the Star Seraphs, and Archlord Kristya and all those cards are more than playable in the Cyber Angel deck. You even got Herald of Orange Light for a hand trap and Cyber Angels can get to more LIGHT Fairies to discard with it. It is easy to tribute Benten as well with Natasha and Idaten to Ritual Summon if you don’t have any other monsters for Vrash, Dakini, or Izana and Idaten will search for a Ritual Spell from your deck or GY and Natasha can gain you LP and become a permanent Change of Heart when in the GY basically if you properly Ritual Summon it first. Benten is a very good card in Ritual Decks that use LIGHT Fairies in abundance and is a great three of in those decks. Art: 4/5 She looks like a lady you don’t want to upset, especially knowing she can burn you now. Cyber Angel Benten is appropriate for Throwback Thursday, given the choices, and this, as most of the week has, makes me remember Alexis from the GX cartoon. Benten is a Light, Level 6, Fairy type, Ritual Monster, with 1800 attack and 1500 defense. Right away, you’re probably put off by a Level 6 Ritual with paltry stats like those, but you’ll note first that Tributing her nets you a Light, Fairy type Monster from your Deck. Benten also comes with a burn effect, when she destroys an opponent’s Monster in Battle, your opponent takes Damage equal to the original defense of said Monster. 1800 attack (still) isn’t great, but it’s enough to take out a fair share of Monsters being a decent beatstick, if nothing else. Of course, the play here that helps you more is to Tribute Benten (or even use as Discard fodder for something stronger). Benten does combo well with Cyber Angel Idaten (who gives a 1000 attack point boost to your Ritual Monsters) bumping Benten up to a very fierce 2800 attack. Honest is always a play with these cards as well, being they’re Light Monsters, for extra power in your corner. She’s a good piece of the Cyber Angel family, without a doubt, and can be even better when used with others. Art: 4.5/5 I rather enjoy all the pink and red on her, as well as in the background. This is a very anime looking picture, as is Benten, herself.